I tried to push images of big waves and fierce winds from my head. I had to find the Professor. 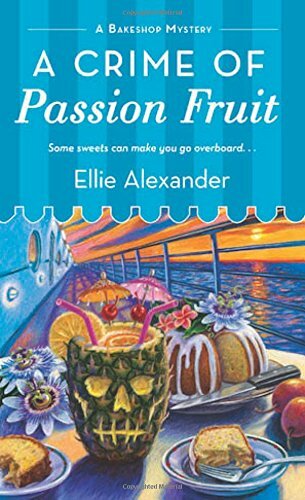 A Crime of Passion Fruit by Ellie Alexander. When Jules Capshaw accepted an invitation to be the guest pastry chef on a tropical cruise, she expected sunshine and umbrella drinks, maybe a rekindled romance with her estranged husband. What the baker and amateur sleuth found was death on the high seas! Ellie Alexander latest edition in her Bakeshop Mystery series is a perfect summer read! Find out more about Ellie and her books here. Read my author interview here.